There is a big shift happening today in the market world. Marketing used to be practice where people build relationships with other people (customers, partners, vendors). Today, marketing is no longer about the relationships between people…it’s about relationship between people and technology. Successful organizations understand this very well and they rely heavily on the marketing technology stack to deliver results. I know you must be asking what constitutes the marketing technology stack or even better how to structure the marketing technology stack for growth and efficiency. Jeremy and I have been connected to marketing technology world as a customer and vendor for more than a decade each. We thought it would be great to discuss how technology has shaped marketing and what does the future holds for marketers and technologist. Join us and learn how your company can use technology to become a world class marketing organization. What are the key components of the marketing technology stack. Why is marketing technology stack so important. Top 5 marketing technology hacks. Jeremy: Thank you for joining Analytics Today, a podcast series that focuses on big data and analytics, digital marketing and the latest trends in digital world. I am Jeremy Roberts, your co-host and with me is my co-host, Sameer Khan. Hey, Sameer. Jeremy: How are you doing? Sameer: It’s a new year. Jeremy: It is a new year. It’s 2016. A lot of things are changing in the marketing world. Sameer: A lot, a lot. Jeremy: I think, it’s a unique year. It’s one of those to where, obviously … Okay, let me start by saying every year it seems like when 2015 happens or 2016 happens, we’re saying this is a big year. I really do think 2016 is going to be one of those big years for marketing and marketing technologies. Sameer: That’s great. Let’s talk about that then. Jeremy: Yeah, sure. Today’s topic … It’s called How to hack the digital marketing technology stack? This is a topic that I think is near and dear to both, Sameer and I. It’s how we’ve evolved as digital marketers and marketing analysts over the past few years and it’s something that … Actually, we were talking about this a while ago, Sameer, you and I could probably talk on this thing for hours. Jeremy: Yeah, it’s an absolute passion. It’s something that we geek out over. If you ever see us out at a conference and you start talking about digital marketing technology and the whole stack, watch out, have some snacks in your hand, have a drink in your hand, because we’re probably be there for a while talking about it. Yeah, it’s so true. Sameer: It is true, yeah, because if you look at it, from experience as well, it’s not just about marketing, it’s not just about analytics, it’s also about the underlying technology that has reshaped the marketing world and the analytics world. Jeremy: Absolutely. If you think about it, if you read the chief Mark Tech blog or Scott Brinker, great blog, great guy. If you haven’t connected with him professionally, both Sameer and I highly recommend it. Really talking about the state of the marketing technology. Marketing is … It’s really all about technology and recent study done by the chief Mark Tech blogger, there’s 90% growth in marketing technology. Now, we have close to almost 2,000 marketing technology solutions in the market. It’s time to realize you can’t function without technology. It’s really evolved over the past decade. Sameer: Absolutely. It’s reshaped. Talk about 10, 15, 20 years ago, there was not even a search engine in place to perform search and identify the products or services that you’re looking for. Fast forward 20 years from there and then there was not even a proper analytics mechanism. Sameer: That people can track the behavior and map that out and rationalize the business results and marketing ROI. It was all done through anecdotal data sets. You know it, the media buys, how they were done and billboards and all those things. We have come a long, long way on what marketing technology can do for us and what marketing technology will do for us in the next few years. It’s going to be very, very exciting stuff. Before, we were not able to see how conversion can be driven from a specific action that marketing performs. Now, we’re getting to the point like hey, we’re not only worried about the conversion driven by one action, but what about the multiple action that drove the conversion? There are technologies to help us with that. There’s technology that can help us map the individual people or persons who are coming to your website or digital properties and converting. There’s technology that can help us consolidate all the data sets into one data, so you can have a view of that underlying customer. Everything is driven by marketing technologies, so it becomes absolutely crucial for us to have a discussion about it in this podcast. I think, it’s going to be very, very critical for those in the marketing and analytics field to pay attention and start taking their skills to the next level, a notch up from where they are. It’s not just about learning how marketing functions, it’s also about learning how marketing technology functions and how you can take advantage of that. Jeremy: Absolutely. Let’s do this. Let’s paint a visual picture, let’s bring back some old memories for some marketers about. This is Sameer and I back between, let’s say 2005 to 2008. 7, 10 years ago. Back in the day, Sameer and I were sitting there, we were working on different marketing programs and we were out there doing ton of print ad purchases, we were doing media buys and display ads, some really basic search stuff, email marketing and so on. I remember when we were doing our email marketing programs, it was really people-centric, meaning it took a lot of human resources, people resources to actually get a lot of things done. Nothing was really automated, nothing was really specific to a customer, more like the old terminology called spray and pray. Let’s go out there and just do a whole bunch of things, very basic, very manual, time consuming and let’s see what came in. The beauty of it all was that we were relying on such terrible metrics. When I say terrible metrics, for email, all we cared about was open rating click-through rate. Those were the big things with email. Imagine that today, that you’re sitting there and all you’re worried about within your email campaigns and you’re measuring your success by only the open rate and only the click-through rate. But not what time they clicked on that? Where they clicked on it? Do they go to the website? Was there a conversion on the website? And so on. Because you couldn’t really track all that stuff. It was difficult to track. Jeremy: You didn’t even know who it was from. It was just so basic back in the day. I remember all of our data metrics. We’d sit there, go into meetings and we’d have these analytics reports and it was just something as simple as … On a basic level, here’s how all my channels are performing. But it took so many resources, so many people to do all those things. You remember that stuff. Sameer: Yeah. Accountability was also fairly sparse and back those days, when we didn’t have any technology to hold particular department or a group accountable in terms of the business they drive. It is funny that you were saying that, because I was thinking about it. Before, marketing was all about relationship between people. Now, it’s all about relationship between people and technology. Sameer: That is a huge shift in the thought process and in the way marketing operates. It was more like a sales driven activity where you’re talking to people, you’re talking to vendors, you’re talking to your customers and different avenue. Now, your technology is actually doing the job for you and your responsibility, as a marketer, is to make sure that the technology does the job the right way or it gets fired and you hire new technology. Jeremy: Yes. If you think about another terminology or another way I think about it, is it was more about the ability of that marketer to build relationship, not only with their customers, but with other marketers. It was all about building those relationships, making sure that you could be … You had to be a good people person, you had to be nice and friendly and be able to build these relationships and so on. As you’re saying now, building the relationship with the technology … The irony of it all is the marketer has to build this unique and working relationship with technology to be able to understand how it works and to get the most out of it. But that almost seems like, well, if you’re going to be doing that, it’s really unpersonalized and it’s so generic and cold. Because as a marketer you’re building these relationships with the technology. The irony of it is you’re actually becoming more aware of the individual customers that you’re going after. Jeremy: Rather than just [crosstalk [00:08:51]] a segment of buyer persona, you’re actually going after the individual customer, because you can have within a buyer persona 10 different customers that are completely different within that buyer persona. Sameer: 2016, thank you. I’m still in the last year. Great. Let’s carry on with the conversation. The second part of the conversation it’s why is the marketing technology stack becoming more and more important? 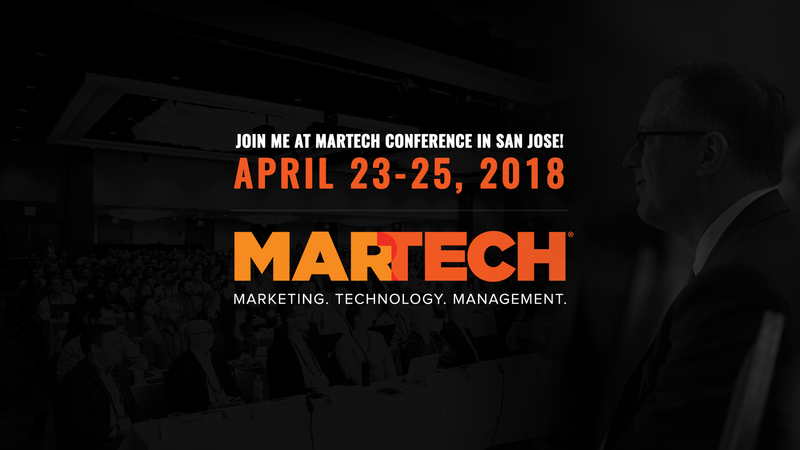 Jeremy: For me, the marketing stack is important because when you think about it, as you start to procure and really lay out the foundation of all your different marketing technologies, you have this massive growth of data. It’s all about data. You could be … It’s almost like a paralysis analysis. You can really get inundated with so much data that you won’t know what to do with it. You’ve got to have the tools to be able to take in that data, absorb it, comprehend it and push out something that’s an actionable insight. You see a massive increase in mobile and digital device usage and also the data from that. But then also the growth in SAS services and digital delivery. But the beauty of it all is that there’s a science and there’s an art. The science is getting the right technologies that work for you within that stack. The art of it is where within that stack do you use the different technologies? And where you can’t. There’s no such thing as a single technology within the stack that’s a one size fits all, that does everything for you. It’s knowing which ones work together. Jeremy: Oh my gosh. You know what? I’m going to be blunt here. Jeremy: I’m going to be totally blunt here. It’s total, total crap. When they come to you and they’re like, “We have this tool that can do everything for you.” Come on, it doesn’t work that way. It really doesn’t. There’s a point at where your product works and where it doesn’t work and we have this giant hole. All of a sudden you’re having to go … and I remember doing this even 2 years ago. Having to go and open up 3 to 4 different technologies into the … each of their own analytics parts of or the technology login and go into each of the analytics section and trying to, say, wow, this one told me this performs like this with this data. Then pulling up another one, why do you think I have 2 or 3 screens at my desk at all times? Jeremy: So I can open up each one and try to figure out what’s going on. Sameer: That’s where we want to talk more and more about the marketing technology stack. Not only that, but also how these technologies interplay and integrate with each other. The integration and interplay of these marketing technologies becoming more and more important, as people start to use these technologies. Because the biggest frustration marketers has … One of the data study that we did at IBM that identified that on an average, an organization or marketing organization uses more than 20 to 30 different technologies at the same time. Sameer: Imagine having 20, 30 dashboards and data that you’re collecting from it. Jeremy: Oh my gosh. Let me paint a quick picture scenario here. You’re a marketer, right? Today is Monday. You walk into the office 9am and the first thing that happens is your business analyst or somebody from your team, let’s say you run a marketing team, right? They walk up to you and say, “Uh oh, sales are down big time. Something’s going on.” The first thing you do is take that little nugget of information or walk over to your management’s office. It’s like [9:05]am. Then, all of a sudden you say, “Sales are down, something needs to be figured out.” What does the management do? You’ll start saying, “Okay, we have an issue here. Let’s go and figure it out.” What’s the first thing everybody do? Everybody goes to the marketing technologies. They’re all dispersed in different rooms, using different technologies and they’re all running their own reports. An hour or two later, they all come back with, I don’t know, 20 different reports? Everybody is sitting there, trying to compare the reports to see where things are wrong and there’s no communication between each one. Then, after that you go and you try to identify where are my bottle necks? Where are my issues? And you try to see how one technology affects the KPS for another technology and you spend an entire day on this. It’s just absolutely terrible. Sameer: Not to forget, the cycle of meetings that follows with that, right? Your calendar quickly starts populating and exploding. Jeremy: Yes. Basically, what you had planned to accomplish that day has been pushed the whole week. Because your whole week now is dedicated to interpreting data from multiple technologies within your own make-believe marketing stack. It just doesn’t work anymore. Sameer: Not at all. With that, let’s talk about the marketing technology stack and what are the different components of that stack. Sameer: First thing first. The foundation of the modern marketing, if you may want to call that, is the infrastructure which is the digital infrastructure, or the web or the mobile infrastructure. That is the critical and most important piece, more like a foundation of the house when you’re building a house or building a building. You’ve got to have that base infrastructure in there, which entails a lot of different technology pieces, which is scalable server, security and firewall, your content management platform, your content delivery network, CDN platform, digital asset management. There are lots of different ingredients of that web infrastructure pieces that you have to put together. It’s not like you go and buy a whole lot of marketing and analytics technology. But if you don’t have your base infrastructure in place, you’re going to end up in problems. Jeremy: It’s funny. You and I come from the Could world. Cloud and hosting world. It’s one of those things to where, I don’t know why it’s so easy for companies just to oversee. If you’re stocked with a legacy web infrastructure and you don’t have servers at skill, you have single servers or the firewall sitting in some backroom of your office and you’re not ready for growth, that’s a huge problem. That’s an absolute, huge problem, because how do you expect to grow? How do you expect to increase your traffic? How do you expect to skill for the peak seasons? Sameer: Yeah, absolutely. There’s no possible way. When marketers are thinking about like, hey, now we’ve got to invest in marketing technology and we’ve got to make investment in the marketing technology stack, the most fundamental of that is the … in digital infrastructure or web infrastructure. You’ve got to check box on that first. You’ve got to check box on all the components that entail web infrastructure, before you start moving on to the different … the layers of the stack. Jeremy: Let me caveat that by saying, marketers, don’t go out there and start freaking out because you have to learn about servers and firewalls and CDN and CMMs and you have to learn about how all that works and hybrid solutions. That’s not your job. It’s a job of IT. IT is going to be the one who’s going to end up procuring the stack. Sameer: Yeah. Or the web development team. Great, so the next piece of the marketing technology stack is digital analytics and data management technologies. Again, this is also a pretty sizable chunk of what you’re going to be doing from a marketing and analytics standpoint. Digital analytics allows you to capture the interaction of your visitors and users across all different digital properties that you own and put that and consolidate that with your web and mobile piece that you own. Then, digital data management technologies are the technologies that sit on top of it. If you’re running advertisement or if you’re driving data from your sales force and other tools, data capturing from your operational sources. All of that needs to be consolidated with your digital analytics platforms, so you can have a better view of your audience. That’s where the data management technology comes in and that sits right on top of your web and mobile infrastructure. Jeremy: Absolutely. After that, I think, the next one is UX, user experience. This is all around the experience that your customer has when they come into your site. Really being able to have these tools that personalize the experience, being able to look at user replay and also any type of feedback systems. When you think about it, there’s another study that IBM did, that talked about how … You remember that study, Sameer, right? How there’s a percentage of companies out there that feel that they can control, they have a great customer experience. They turned around and they asked the same customers that question and they found out that customers weren’t in agreement with it. They think that most companies out there fail to really understand their needs and their experience is terrible. Sameer: Experience … Also, there’s another data point on that when we were looking at it. Customer experiences are going to become the number one thing where 80% of the companies are going to focus on to drive revenue by 2020. It’s a huge part of your oral digital delivery and revenue creation, is the customer experience. More importantly, like we’re talking about … There are multiple technologies that touches the customer experience. I’m not getting to the detail, but there are technologies that can help you replay that entire customer experience that your customer has on your digital properties, feedback systems and loops, personalization that you can do on top of what your customers are already doing to personalize their journey. Let’s say if they’re coming from a different source or they’re coming from a completely different market segment that you’re trying to target. Sameer: The next stack which is a part of the marketing technology stack is marketing execution stack. There are multiple components to the marketing execution stack. You have your marketing automation stack. What Jeremy was talking about, emails earlier. Now, the emails are becoming much more complex marketing tool. There are lots of businesses that have become a multibillion dollar businesses just by using email technology and marketing automation. Then, you have a programmatic ad buying and ad servers, so if you want to collect all the data from your digital analytics, your experience systems, your web infrastructure and then market to this audience programmatically, you have to have a robust ad buying and marketing targeting engine. Then, you have your bit management system and finally, your social media stacks. All of that is a part of your marketing execution stack which sits right after your user experience stack. Sameer: Anything you want to call out on the marketing execution that you can think of? Jeremy: I think the one thing that stands out for me before anything about the execution is … I think, the average marketer that’s listening to this might be freaking out a little bit and you’re thinking you’ve got to be kidding me. Sameer and Jeremy are sitting there in the podcast trying to tell you that one, you now need to advance your understanding and learning about digital marketing and the new marketing technology stacks. You need to learn about web infrastructure. Now you need to go and master digital analytics and data management technologies. Now you have to go and understand user experience personalization, replay and feedback systems. Now, we’re talking about marketing execution with automation stacks, media buys, bit management, social media stack. It seems a little bit overwhelming. Sameer: Yeah. The whole point here is as you take more and more leadership role in the marketing teams, you hire the right people. Jeremy: Exactly. [crosstalk [00:21:36]] Sameer: Yeah, the people who are already experiences in these areas, so you start to build that stack, not by yourself, but hiring the right people who have been doing that for a quite some time. Jeremy: Exactly. When it comes to this, don’t freak out. The automation stack really is just … A lot of it is really getting the right tool. There’s great tools out there from Marketo and Eloqua, down to Silverpop at IBM which is actually now called Marketing Club. Those are great tools, allow you to be able to not spend your days and time just doing all that stuff. Now, programmatic media buys and ad servers, things like the media buys of the world, bit management. Also, the social media stack. Being able to out there and get the right tools that will be able to do all these automated things for you. I know, we have one more to talk about, but I just want to make sure people out there aren’t sitting and thinking, wow, these guys are scaring me a little bit with all these things that I need to know. Don’t worry. Sameer: Touching on the last one, to close a loop on the marketing technology stack is predictive analytics. Sameer: Now, with all this data coming in from all different directions. Predictive analysis has become a core component of the marketing analytics division. There’s a reason behind that. Before, when you had a limited size of data, you could have done your typical lead scoring analysis, your typical marketing automation tool does for you which is behavioral lead scoring based on if your customers performed certain actions, then you score XYZ. Then, you move down the nurture funnel. Versus now, because there is so much data coming on from different angles and plus it’s opening up new data fields. There are customers that you’re currently not even looking at, they’re sitting and buying from your competition. You want to look at that data. You want to get that data into consideration as well. What does this customer looks like they want to go target? How do you modify your existing pipeline or your existing scoring models with the help of that external data? There’s social media data. How do you take that data into consideration? The actions of people that are performing on social media networks? Your customer data and one of the action that customers are doing inside of your infrastructure, your control panels and UIs and your portals, all of that data has a huge implementation of … That data has a huge impact on your oral performance and the leads that you generate. It’s very, very important for marketers to start thinking, if you’re not already thinking, in the direction of having tools such as SBSS or as SAS or leads scoring analytics tools that are out there. Definitely, we don’t want to name, there are a lot of different, we’re not advertising anything. But that’s a critical component of your marketing technology stacks. To sum it up, you have your web infrastructure, digital analytics and data management technologies, customer user experience, marketing execution and predictive analytics. Jeremy: Exactly, and it doesn’t hurt to hire consultants. Find professionals out in the marketplace, out in your field and industry that know about the stuff and start talking to them about their best practices. Sameer: Yeah. Marketing technologist and marketing technologist leaderships is becoming a new path in the marketing world, where lots of companies are already paying attention. They’re hiring these people who have the ability to orchestrate the marketing technology for that organization. Pay attention … If you’re still thinking this is a lot, you probably are thinking … If you’re thinking of hiring a person who can map out a plan for your entire organization, it could be a consultant or it could be a person that you hire and run your marketing technology department. Jeremy: We put together top 5 marketing technology hacks. Sameer: Yeah, we want to do justice to this podcast. Sameer: It’s not like we have a specific title to attract a lot of people. We really wanted to provide some immediate information on what are the different hacks that we can perform with the marketing technology to make our lives easier as marketers? What we have done is we have come up with a list of top 5 marketing technology hacks. We can start talking about, so the first we have here is supercharging lead scoring model. I touched this in the predictive analytics in marketing technology stack, where I was talking about pairing different types of data sources to modify your leads scoring model. Today, if you’re just relying on the Marketo or Silverpop, they have their own lead score to help you getting better leads in the organization. That lead score is primarily based on behavioral data which is if someone downloaded an X amount of documents. If someone watched a video or if someone went to an XYZ portion of your website. That’s all behavioral data. But there are vendors in the market that actually take that behavioral data and top it on with the data source that I mentioned earlier, which is your social media data, your customers external data, the demographic data, you CRM data and map that out and create a model that is much more powerful. Scores that are much more powerful to put you in a position that when you generate leads, you drive better and better leads to your sales people, so you can have better opportunity to drive revenue. Sameer: Keep on optimizing it. Jeremy: Keep on optimizing it. Sameer: Absolutely, that’s a great, great point. Jeremy: I’m not saying every day, but find something that’s realistic for you. Sameer: True. The second marketing technology hack is instead of waiting for your IT department, so instead of spending gazillion amount of dollars in building the marketing data warehouse, find technologies that can help you do quick integration of data. Sameer: There are lots of technologies in the market. Jeremy, you can talk to one the technologies that you’re actually leading on the IBM site. But there are lots of technologies in the market that allow you to be scrappier and integrate multiple different pieces of marketing. Then, be very, very targeted in ad buys and pre-targeting to your customers. There are things like LiveRamp, Segment, Blueconic and Universal Behavior Exchange from IBM. Jeremy: I think, really, the whole reasoning behind this, as we think about it. Here are some typical channels that people use. Search, email, display, mobile, social and web. Those. Search, email, display, mobile, social, web. How do you connect the data from each one of those to really integrate your marketing data to really identify truly what your customer experience is and what their journey is? Sameer: And how to better target them. Jeremy: And how to better target them, because the last thing you want to do is procure all these new tools and all of a sudden you go do run an analysis and you realize that your marketing just fell of the face of the earth and now you have to go back and justify your spend, because your RIY’s down. You’re spending more money because you have these new technologies, but you’re not using the data properly. You have this infinite amount of data, but you’re not using them to make better decisions. Definitely, this is a big thing for me. This is something I’m definitely passionate about. Try to find integrative marketing data tool that allows you to be able to take that complexed customer interest data and identify who your customers are and what they’re doing within a realistic time frame. Sameer: Great. Moving on to the third one. Today again, we were talking about using Excel and relying on isolated data sources. Instead of doing that, instead of relying heavily on Excel, you’ve got to think about simple technology, such as visible Tableau, new data visualization technologies that allow you to pull in all of the data from different sources and present a completely different view that you were not able to present just by using Excel or just by using access. That is another way to amplify your presentations, amplify the message and the insights that you’re trying to communicate, is using technology that allows you to integrate multiple data sources and to present that data in a new, visual way. Jeremy: Here’s an example of how in a previous job I used Tableau. I remember working with our email marketing team and we talked about, as we started to onboard customers, we wanted to build out a messaging program to go after them and to get them to buy again. I quickly went to our business intelligence team and pulled up Tableau and immediately Tableau told us the people that buy this tend to buys this product next within this period of time. The answer’s right there. It was easily pulled out first on Tableau, we knew that if they bought this product. We went out and segmented every person that purchased this product and we built out a campaign to go out and re-target to them about this next product. We knew that they would buy it based on what Tableau told us. It was as simple as that, rather than going through and running inquiries and so on on Excel. That just takes too long. Tableau and Visible are great tools. Sameer: Fantastic. I would agree. I think one of the thing that these visualization tools do they make it so easier to present to the key stake holders and the decision makers. Let’s say, if they’re trying to build a case for developing a specific projects and you don’t have enough data to communicate, but then you get to a point where you’re using these tools and you’re building charts that can easily communicate the value, it just changes the game completely. Sameer: Great. Number 4. Lead capturing is one of the challenges on the website. If you’re using marketing automation technologies to lead nurture, there’s definitely a place where you want to drive more and more leads in your marketing pipeline. How do you do that on a small budget? Now, there are lots of different technologies in the market today that are very, very cost effective and very powerful and very programmatic, in terms of how you can drive people and capture leads data. There is a technology that we use on our blogs to drive leads which has been various and I’m going to show share some of the data from it. We’ve seen conversion improvements in terms of tens of digits just because the way we were capturing lead before and the way drive leads helped us effectively capture that. There’s hello bar. I don’t know if you guys have seen, when you go to some of these blogs, they have a bar on the top of their website that it has design by hello bar. Not only that, it has programmatic capture mechanism when the lead box shows up, when the buyer enters a specific stage or when they’re scrolling a page long enough to the point they’re really interested in more content from your website. Those are the things that are capabilities that hello bar can do to get response. All these simple, cost effective technologies can improve your lead capture by 5x, 6x. We have cases there are like 10x improvement in oral lead capture. The last, but not the least is we all spend a lot of money on media buys. Gazillion amount of dollars are spent on buying leads from different direction. Every single day, we get pitched by different lead vendors trying to sell us leads. Now, how can we be more effective in buying these leads? Let’s say if you’re buying tens of thousands of leads every year, you don’t want to spend tens of thousands of man hours trying to clean up the data and make sure these leads are good enough for your business to be used effectively and drive revenue. One of the quickest way is to have lead … More like a lead cleaning technology and data cleansing technology. The one that comes to my mind right now is Integrate. What they do is they sit between these lead vendors and your web infrastructure and whenever the leads are being purchased from a specific vendor, they have an existing relationship with those vendors. Then leads are sourced through Integrate and they automatically do the cleanup and matching wherever needed for the missing data. If you have a certain amount of leads that are missing values, you can set it back to the lead vendor and get refund for it or, at least, get credit for it and buy new leads. That way you can save a significant amount of spend, a marketing spend and budget by using technologies such us Integrate. I have a pretty good use case, last year we saved hundreds of thousands of dollars of our ads spend, because we were able to quickly identify the bad leads and send them back to get it fixed. Jeremy: That’s fantastic. Yeah, definitely great stuff. Let’s wrap it up here. Basically, taking these top 5 hacks … Take your time really understand what is the need for your company, what is your need? What are your company goals? When you think about it, a lot of it comes down to what are you trying to solve for in the upcoming year. None of this is going to take one month or two months to do. Sometimes, it takes 3 to 6 months or even longer to really build out the right marketing technology stack. But once you do that, this is a great podcast for you to come back and revisit some of the insights that Sameer and I gave you. But I think, it’s important really to understand and then really start to branch off and expand your knowledge into other components of marketing. Thank you again, Sameer and we’ll see you guys in the air. Five Marketing Attribution Stakeholder Personas…Which One Are You?